ribbons, originally uploaded by jahansell. I almost didn't go - too tired after 3 nights in a row out at Jacob's Pillow and Tri-Arts (if you haven't see The Full Monty, GO!) and a day at the Farmer's Market and volunteering for the Historical Society. I just wanted to lie on the couch, sip wine and play Scrabulous. 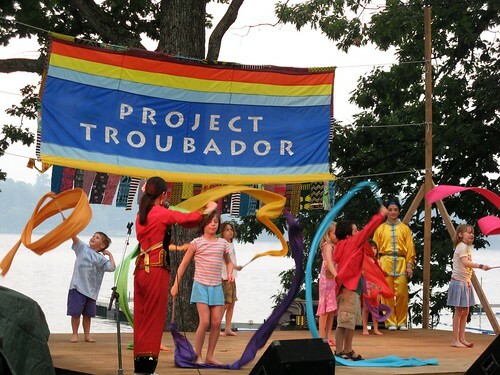 But if I'd done that, I'd have missed one of my favorite events of the year - Project Troubador, the music festival at the Grove in Lakeville. It seems like everyone I know goes, and the performers are fantastic. Of course it's at the beach, so there's plenty to keep the kids busy when they tire of culcha, and you can get in your wine-sipping (and get away from scrabulous for a change!) Here, the Nai Ni Chen company teaches children a ribbon dance - check out the little guy on the far left. By George I think he's got it! A few more photos here - mostly I was too busy dancing! That little boy is darling! I've enjoyed browsing your recent posts, too.